Confused? We’ve Got You Covered! Our customers’ needs come in all shapes and sizes. Some are replacing an old exit sign, some are putting up fire exit signs where none existed before and some still haven’t finished construction on the building! No matter what situation brought you here, it can be overwhelming to sort through the selection of exit signs available. 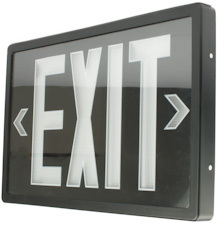 Are there any color or materials requirements my exit signs have to meet? 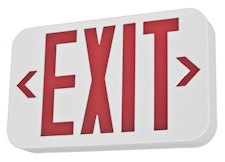 Certain locales require that exit signs have red lettering, others require green lettering, others allow either but may require consistency within a facility (all green or all red). 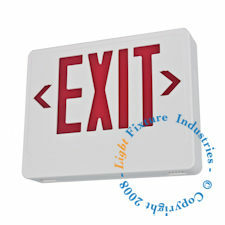 Some locales require that exit signs be enclosed in steel enclosures, other allow fire-retardant plastic, etc. The City of Chicago require steel exit signs with a glass face. 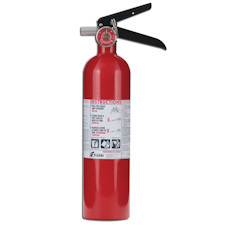 The New York City requires that exit signs have 8” red lettering and be enclosed in durable steel housing. Make sure you are not subject to some of these very limiting requirements. How many and/or in what areas are exit signs required? General requirements state that any exit be marked accordingly, but some codes require marking of the “route” to get to the exit as well. Is there a particular certification my signs need to carry? The most widely used certification agency in the United States is Underwriters Laboratories Inc. (UL), but some areas require ETL SEMKO certification or other certifications that are more specific. Canada requires a certification from the Canadian Standards Association (CSA). Are there certain types of units that are prohibited? Some codes require that your units be hardwired (eliminating power-free choices) or a certain color/material (see question 1). Do I have a particular look in mind? Your local codes may not require it, but perhaps a brushed cast-aluminum sign with lettering fits best with your décor. Maybe you’ve seen an edge lit sign in your favorite store and liked the look, it’s up to you! Do I have size constraints and/or how do I plan to mount my units? This question alone may limit your selection to only a few items. Remember that certain mounting configurations may require the use of a mounting canopy that adds 1-2” to the height or width of your sign. This question also encompasses limitations such as a sheet rock, drop or low ceiling. Will these units be subject to abuse or hazardous environments? In areas such as schools, gyms, warehouses and parking structures, exits signs may be subject to vandalism, damage from sports equipment and other types of situations which would limit your selection to heavy duty construction or protection such as a wire guard. If installing in areas where the units will be exposed to chemicals, abrasive substances or other hazardous materials, your selection should be limited to units “rated” or qualified for installation in these environments. By now you will have gathered enough information to narrow your choices to maybe even just one unit! If you are having trouble navigating our site – feel free to contact one of our award winning customer service professionals via phone, email or live chat with your requirements and we will be happy to assist you. The Exit Light Company offers a complete selection of carbon monoxide detectors (alarms) designed to meet the specific requirements of different locations and potential dangers. The leading cause of accidental poisoning deaths in North America, Carbon Monoxide (CO) is odorless, tasteless and invisible – a silent killer. The only safe way to know if carbon monoxide is present is to install carbon monoxide detectors (alarms) on every level of your home and in sleeping areas. The KN-COB-DP-LS is a great fixture for customers wanting to increase their protection without the cost of installation. The Nighthawk 900-0235 AC Powered, Plug-In carbon monoxide alarm with battery backup is an easy to install unit that provides reliable protection against the dangers of carbon monoxide. Written information and instruction make this unit’s operation easy to understand for anyone. The Nighthawk AC/DC Basic alarm has a small, sleek design that is suitable for all living areas and has a 7-year limited warranty. The Nighthawk 900-0235 provides you and your family with a loud warning signal against the dangers of elevated carbon monoxide levels in your home. The battery backup feature provides continuous monitoring of CO levels, even during power outages when AC-only units are not providing protection. 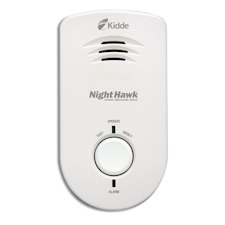 The Nighthawk CO alarm has a 7-year product life, providing 40% longer protection than other CO alarms. 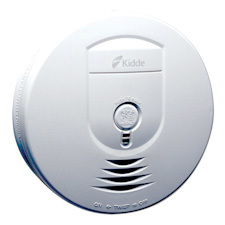 Click here to see all available carbon monoxide detectors including smoke alarm/carbon monoxide combination units.